Fanfest has been described as to Eve Online players what Mecca is to Muslims. It’s a lazy analogy, lacking in subtlety, part truth, part misrepresentation. 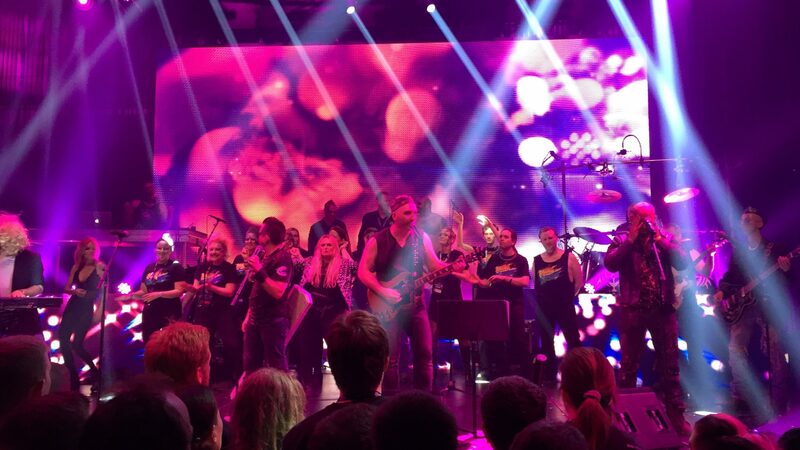 Our Gods wear black shirts and roll down stairs to a cacophony of Bohemian Rhapsody. Our towering, glistening, onyx meeting place lies on the edge of a cold, volcanic outcrop far from sun and sand. And the antics of the Friday night Pub Crawl could be called many things, but I doubt ‘religious’ would be one. This was my third Fanfest. I’m not going to attempt to tag it with any sort of ‘best’ nomenclature. Each has been different and each special in its own way. 2013 was my first trip to Reykjavik and still stands as the largest Fanfest in history, coinciding with the 10th anniversary of Eve Online. As someone on the relative fringes of being known in the community, it was a brilliant, intense, mesmerising, confusing experience. I made many of the mistakes MainDrain made in his first visit this year, slavishly attempting to maintain some semblance of a timetable, often at the expense of enjoying the experience as a whole. there is no greater, tangible way to understand what you are part of in New Eden than standing in Harpa with thousands of other geeks. In hindsight, FF 2013 was also the last out-and-out ‘hype’ Fanfest – audiences taken to fever pitch with promises of features that would never come to fruition. While still an epic birthday party for a universe coming of age, smoke and mirrors were ever present. On the other hand, there is no greater, tangible way to understand what you are part of in New Eden than standing in Harpa with thousands of other geeks. People who may appear simply as Ishtars or Archons or Armageddons tens of thousands of years in the future are suddenly made flesh in your presence. It’s a short, sharp juxtaposition that takes some time to wrap your head around. I found that a few shots of Brennivin helped. I missed 2014 as real life does what it does best, rearing its ugly head. It is notable however in being the Fanfest in which I was confirmed as a member of the Council of Stellar Management. No amount of staring at my laptop screen could clone jump me to Reykjavik that year. I tried nevertheless. 2015 was significantly different to 2013. CCP had learned from previous mistakes. Fanfest was far less about ‘Eve Online’ and far more about ‘Eve Online players’ – a subtle but vital distinction. The programme was stripped down, allowing more time for the simple art of ‘hanging out’, a greater emphasis was put on the part of player presentations and for the first time, EVE TV was assigned a number of capsuleers to help link from keynote to keynote on Twitch. I was one of those EVE TV player presenters, an unbelievable experience, but one that again kept me beholden to some strict timeframes as I traversed from hangover to painful hangover. And so we fast forward to last week and Fanfest 2016, my third attempt at fully understanding what happens when Eve players invade a city en masse. Freed from the bonds of CSM, EVE TV and a minute-by-minute timetable, riding once again with Jeg in his first visit to Iceland since 2013, this was the truest Fanfest experience I have had yet. We attended most of the presentations we wanted, missed some we would have loved to have watched and spent far too much time huddled in the corner of some bar, nursing a pint of ludicrously expensive Gull, regaling stories of lost apartments and out-of-key Common People. Some of the presentations were magnificent. Andrew Groen captured the essence of his seminal book ‘Empires of Eve’ in a wonderfully alluring 45 minutes. The realisation that I have some tiny part to play in that story (C-J was my first major engagement as an Eve player) even if I never warranted a mention in his tale was breathtaking. Social Scientists Study: EVE Online on Saturday morning was a statistician’s dream, enveloping a colossal volume of data from the future-race that is New Eden’s inhabitants and breaking it down into how we represent our countries and regions on this mundane 21st century terrestrial existence. And that Alliance Panel! Man, it was good to have the Alliance Panel back in all it’s overwrought, painfully mistimed (I’m looking at you Seleene), incestuous, alcohol-ridden glory. As is tradition by this point, the quality of presentation on offer ranged from genius (Dunk – Brave), hysterical (ExookiZ – WHBOO) to the downright awful (Chendow – BSTN, why did you even bother). 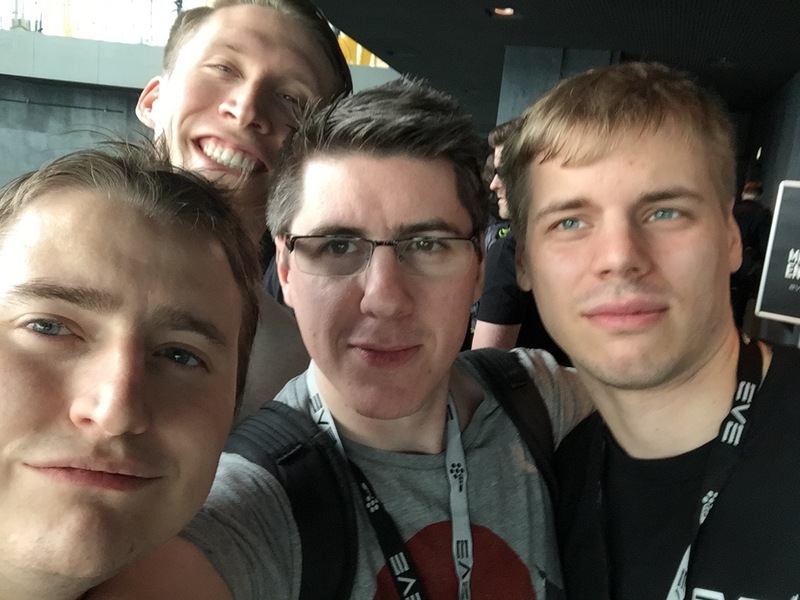 I hope that as part of this greater embracing of the concept of ‘community’ at Fanfest, CCP throws more weight and time behind the Alliance Panel next year. It’s a cornerstone of the experience. For the first time, it felt like Crossing Zebras had stepped up into something real and accepted in the community. I was sat at the front row of the Alliance Panel along with Jeg and Niden. We had met as a trio for the first time ever in the airport only three days previous, Niden swagging it up with his press pass. On top of this, we had another 12 CZ Fanfest attendees all working overtime to give you amazing content throughout the three days. For the first time, it felt like Crossing Zebras had stepped up into something real and accepted in the community. We all had dinner together in a tapas restaurant on the Friday night before the Pub Crawl and just being there as friends who work online with one another every day was a moment I’ll never forget. What started as a daft wee podcast between Jeg and I is now something so much larger and that became infinitely more tangible in Reykjavik this year. Then 24 hours later, we were the talk of Fanfest after a certain article caused repercussions throughout the entire community. DJ told me about said diatribe for the first time during the Alliance Panel. We were receiving constant updates throughout the Closing Ceremony and had to rush back to the apartment the moment it was completed to load the piece into the back end and monitor the server. This was going to be the first real test of the site Jeg and Niden had put so much effort into. The hamsters did what they had to do and we strolled back to the Party at the Top of the World as smug as smug could be, everyone discussing one of the biggest political maneuvers in New Eden in years, announced mere minutes before on CZ. It was a perfect crystallization of months of effort developing the site to where it is now. The Party, like all the social events at this year’s Fanfest was superb. I was lucky enough to have a major night out planned each of the first four evenings of Fanfest. On the Wednesday was the legendary Tweetfleet meet, moved from it’s old home at the Celtic Cross (RIP in peace) to new surroundings at Gaukurinn. The Cross has a soft spot in my heart but had long outgrown it’s usefulness as a venue due to size and layout. Gaukurinn is bigger, more comfortable and unfortunately for some, has karaoke. 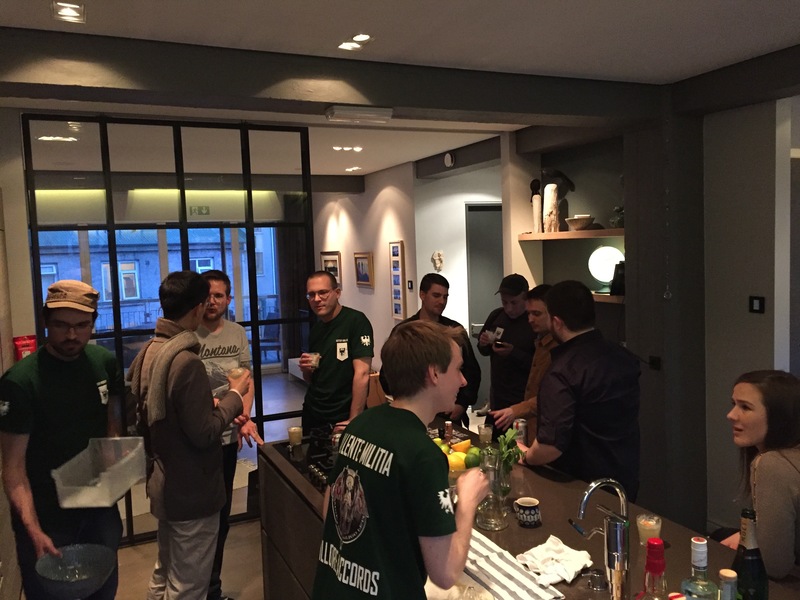 Thursday evening played host to the now-compulsory GMVA party. Julianus outdid himself this year with an amazing penthouse apartment overlooking the harbour, GMVA challenge coins for each attendee, a bonafide bartender in Nariyu and the most perfectly timed broken lift in history. How he one-ups himself in 2017, I can’t even imagine. There were many Pub Crawls you could partake of on the Friday, but everyone knows the cool kids get in on that Team 5-0 action. I made sure we were front of the queue for Harpa opening again on Friday morning so a bunch of us CZ guys and our friends would be part of that 25 being lead around town by the likes of Fozzie, Larrikin, Punkturis and Mimic. It was a perfect Crawl, culminating for the second year in a row at the Indo theatre near Nora. MainDrain got it right yesterday – don’t go to Fanfest without doing the Pub Crawl. And so there we are. An amazing Fanfest. I’m not going to sit here and say it was perfect. I can’t claim I wasn’t somewhat underwhelmed by the Eve offerings on display. The Eve Keynote was a little flat for me (outside of those ludicrously stunning pirate caps), Nova is beautiful but pointless and Arena remains an amazing tech demo as opposed to something I can see actually happening in living rooms the world over. But all of this is tangential. After everything, we are left with one simple, beautiful truth. Fanfest is not a celebration of internet spaceships or Citadels or markets or planets or modules or anything else so mundane. 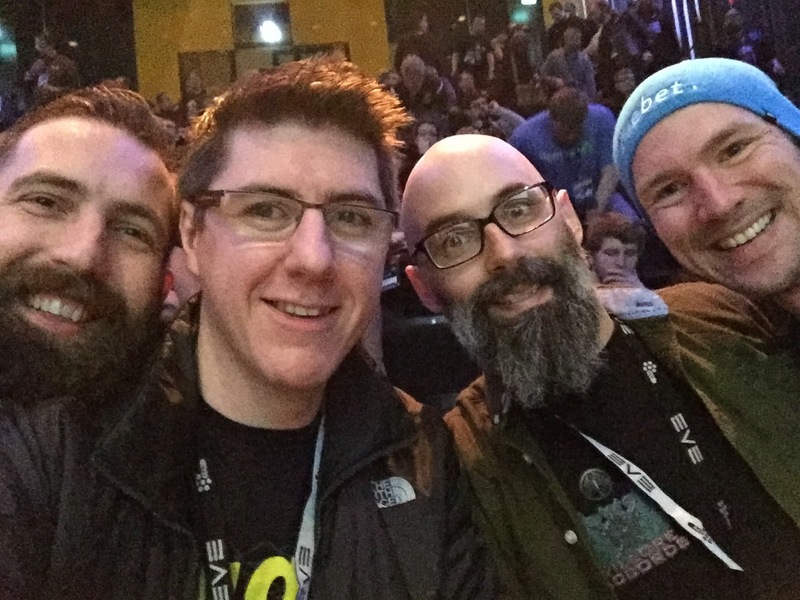 What makes Fanfest a religious experience worthy of annual pilgrimage is Eve players spending time in physical congregation with the one thing that makes New Eden – us.